Indiana World War I Service Record Cards This is a work in progress. Many Miami County young men were sent here. 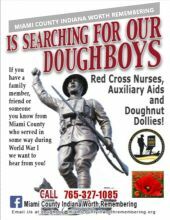 MIAMI COUNTY INDIANA WORTH REMEMBERING IS “SEARCHING FOR OUR DOUGHBOYS, RED CROSS NURSES, AUXILIARY AID WORKERS AND DOUGHNUT DOLLIES”! On the Miami County Courthouse square in Peru, Indiana stands a Doughboy statue. Dedicated on November 11, 1930, it honors all of those who served during World War I from Miami County. On the limestone base of the statue is mounted a brass plaque engraved with 17 names of Miami County Gold Star veterans who died for their country during the Great War. They have been remembered, many more have not. As a part of a two-year Indiana World War I Centennial committee endorsed set of projects, “Miami County Indiana Worth Remembering” is searching for information and images relating to the lives of over 1,000 men and women from Miami County, Indiana who served and/or contributed to the war efforts during World War I. 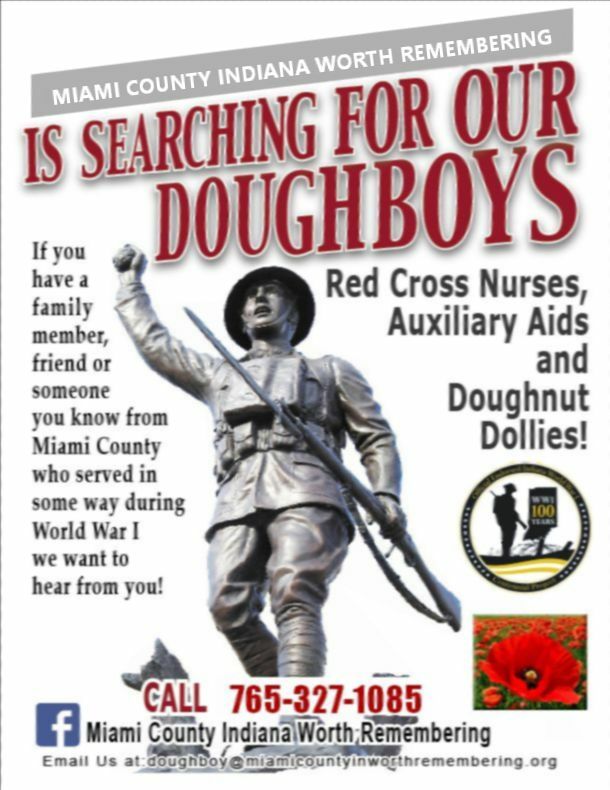 If you have tales told at the kitchen table passed down from generation to generation about your ancestors’ daily lives during World War I, or know of someone who served in the Great War, please call 765-327-1085, join our Facebook page or email us at doughboy@miamicountyinworthremembering.org. We can help you share your stories with generations to come! 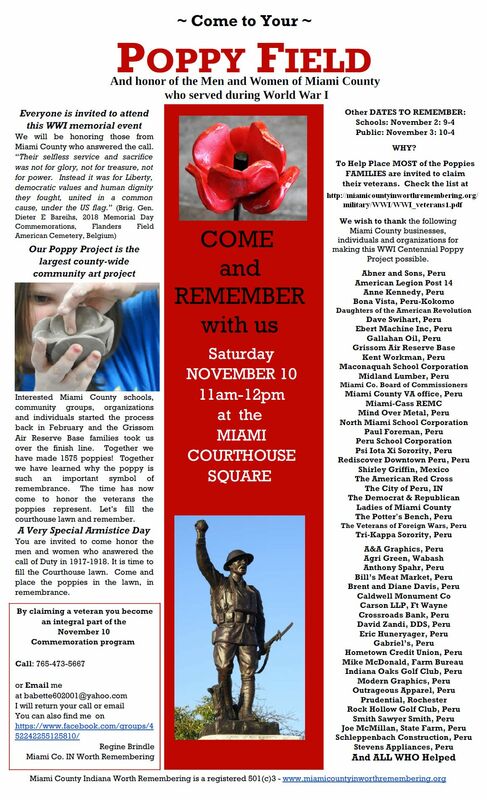 We will be honoring Miami County World War 1 Veterans on November 10, 2018 in downtown Peru. Please plan to attend. Schools will be placing poppies on the courthouse lawn on November 2, 2018 from 9-4. The public is invited to place poppies on November 3rd from 10 - 4. During ceremonies beginning at 11 a.m. on Saturday, November 10th Families and individuals will be placing poppies in memory of Veterans in their family as part of the program. See the flyer.